I'm going out to my in laws for supper and will make the draw for the magazines later to-night. I'll take entries by way of comments until then. If your interested, you can scroll down to last week's posts to see them. It's sort of a blustery cold day. We've had some wet snow; other areas have gotten more I believe. 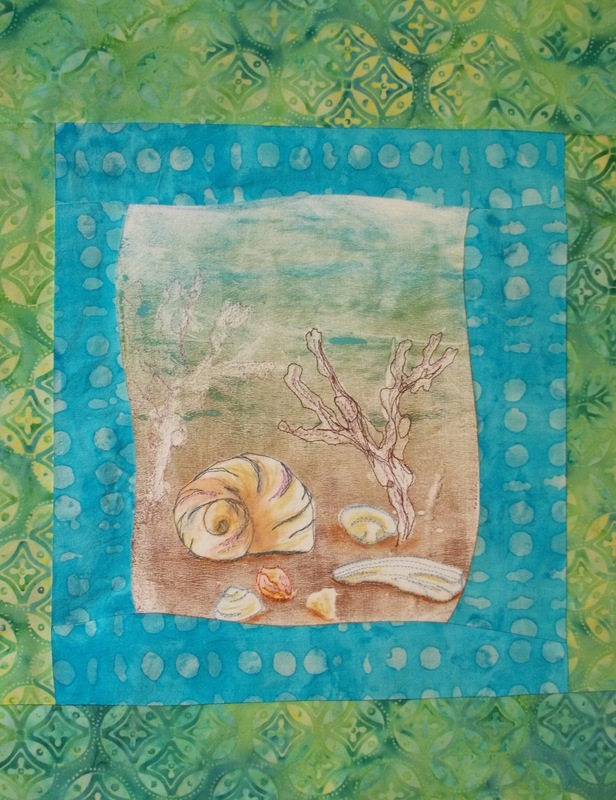 I'm still in my pajamas as I've been working away at my seashell piece. 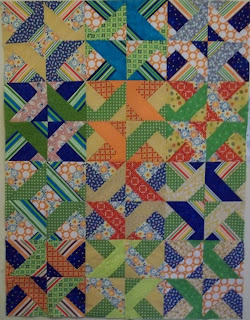 I think I'm finished except for the backing and the binding. This morning I did a couple more little bits of embroidery and beading. When I was putting things away, I found my little sketch and noticed I had drawn some fish, so I decided to add them. One thing leads to another. Earlier, I had cut out some sparkly tulle strips so I put those on too. I'm not sure if you'll be able to see them or not. 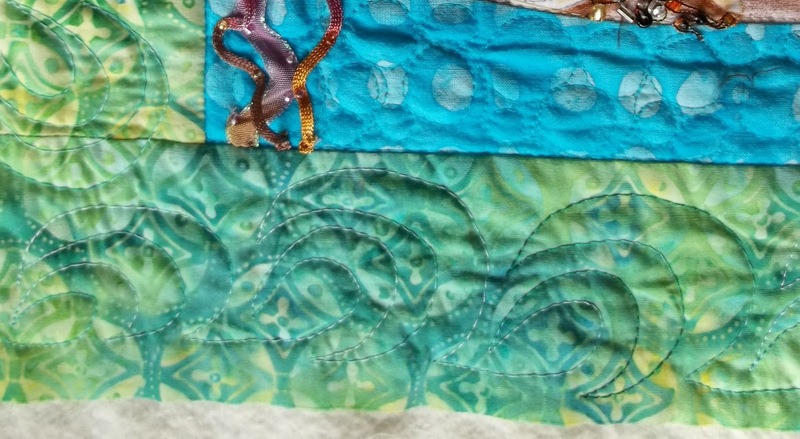 You can see the lines of stitching though at an angle to the fish. Today was one of those relaxed and lovely days. It was sunny, windy, a little cool and perfect for hanging out clothes. 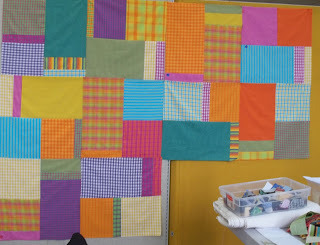 I don't know why, but that is a job that I really enjoy, pinning up each piece just so to the clothes line. I used cloth diapers when my children were young when everyone else was using Pampers, and it was always so satisfying to see the line full of those white rectangles of flannel. 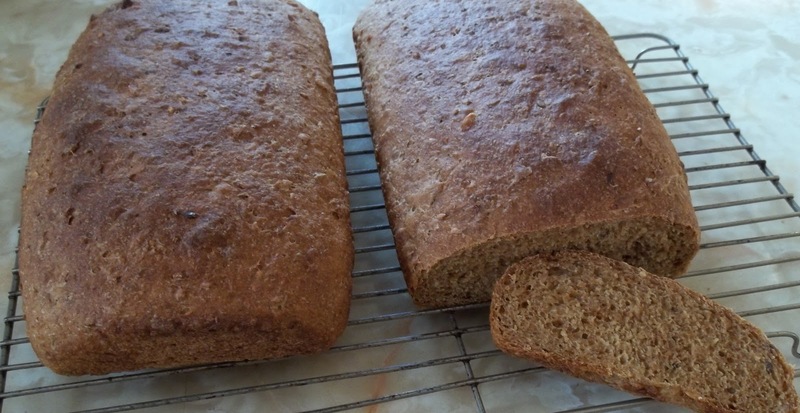 So, I got the clothes out, and then I made a mixed up a 12 grain bread and started baked beans. The bread turned out perfectly; it looks small because the pans were really a little too big for the size of each loaf. This afternoon, I put 3 inch borders on the baby quilt. I found a piece of fabric for the backing but I will have to pick up batting tomorrow. 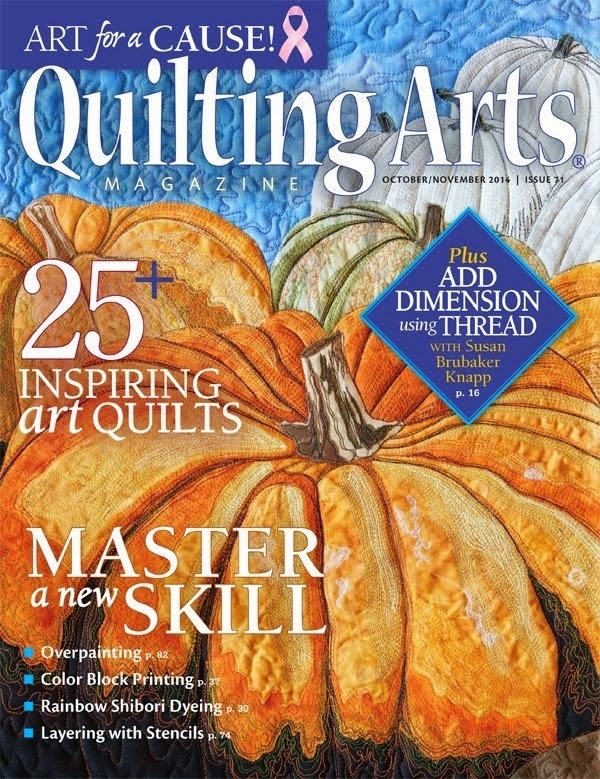 I plan to machine quilt it myself. 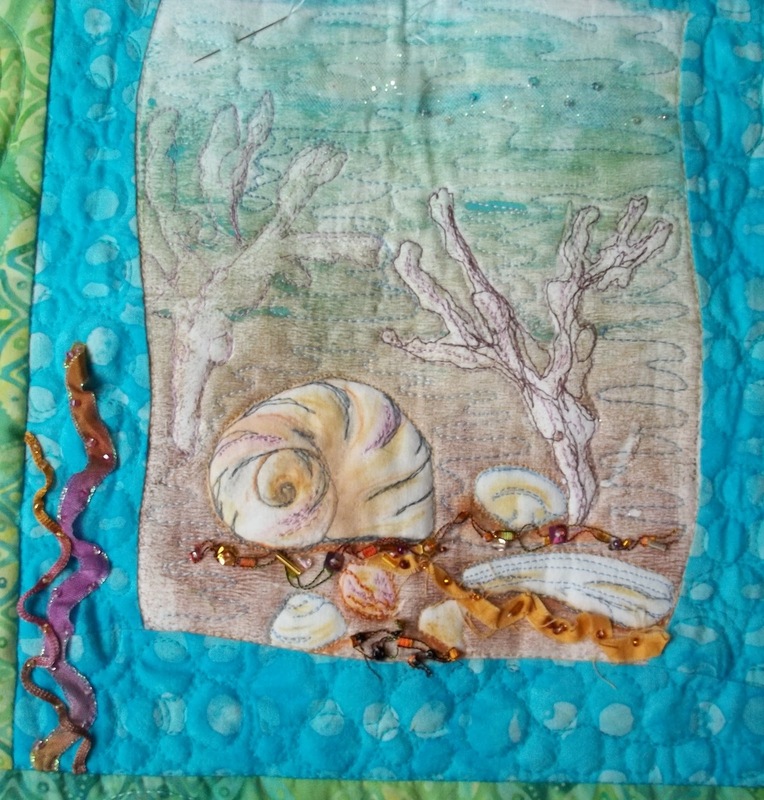 After that, I made myself a cup of tea with a side of fresh bread and molasses (this is why I can't make bread too often) and spent the rest of my time working on the embroidery and beading of this piece. I still have a little more to do but I am happier with it now. 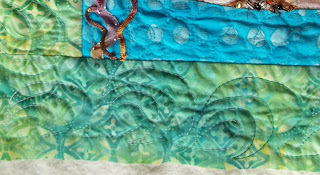 I had a couple of comments yesterday about the machine quilting so I'm adding a close up of the outside border. It is a continuous shell design. Finally, don't forget if you comment, I'll put your name in for the 2 magazines in this post. I'll make the draw on Sunday night. Yesterday, I would not have imagined that I would feel like going to my weekly swim at the spa today, but I felt pretty good when I woke up this morning, so I went. Also,I was very achy form lying about yesterday. The salt water pool, the whirlpool and the sauna fixed that. 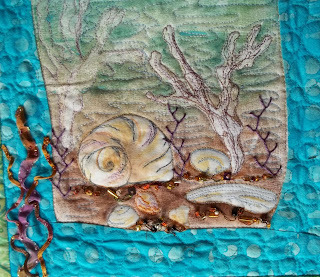 Then, I had to mail something and go to a hair appointment which means all I have to show today is my seashell with the little bit of gold removed. I was bothered yesterday by how pale the picture looked so I removed one little bit and added some more color using the Neocolor II crayons. I am happier with it now. 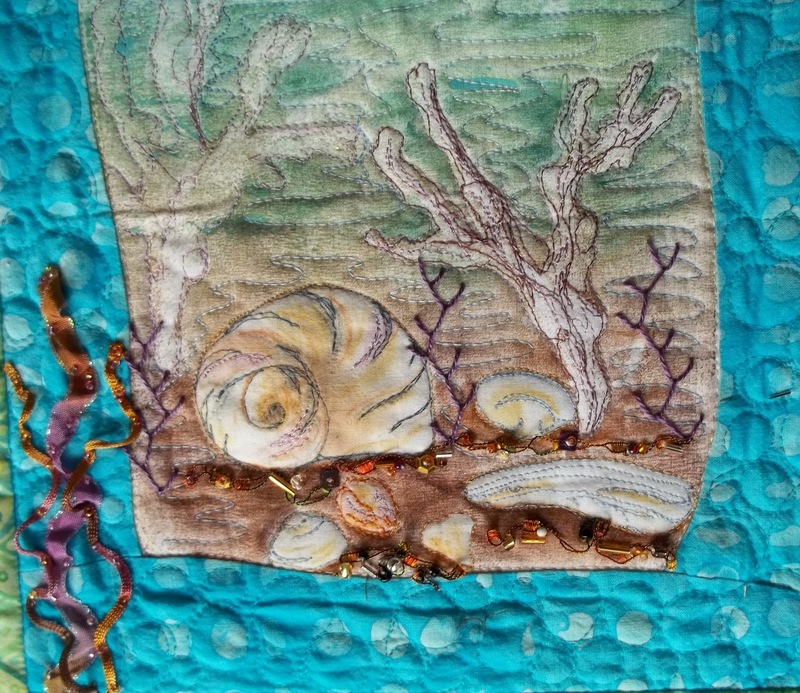 I find the shell, the rocks and the seaweed stand out a little better. 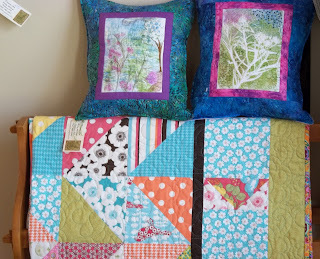 Now, when I can sit down , I can go back to embellishing. 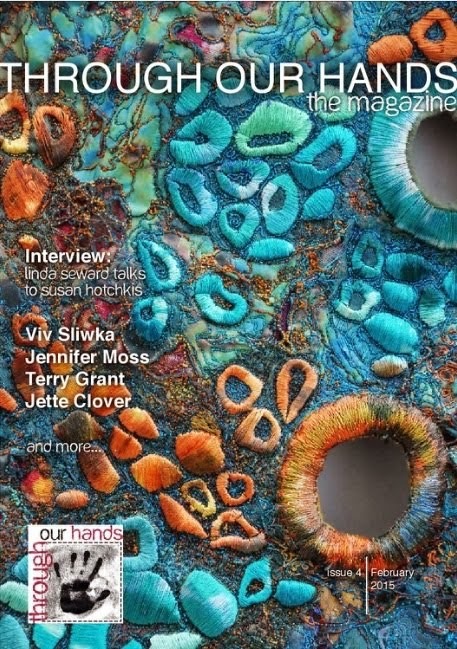 Don't forget to leave a comment of you'd like to have the 2 magazines I showed yesterday. As promised I've taken a picture of my seashell. 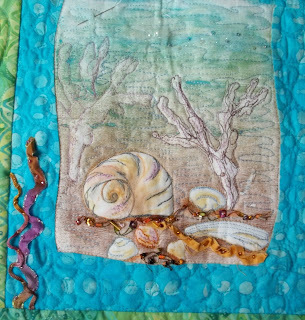 Once I had a look at it, I decided that I'm not happy with the gold that is in between the seashells at the front and I want to change the placement of the tulle above the shells. You may be able to see it in the detail photo if you enlarge it. I may get to it today or not. I'm coming down with a bit of a cold. The cold itself does not seem too bad, but due to my adrenal issues, I'm very fatigued and achy. I've been sorting through some magazines this morning. This afternoon I may stretch out for a bit. 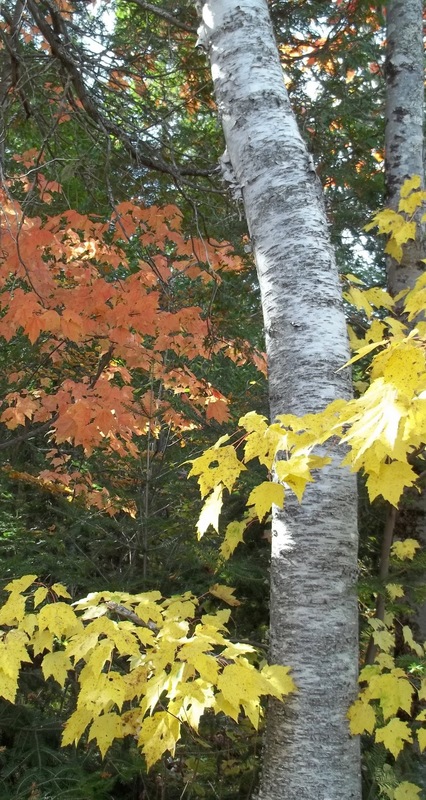 It occurred to me in the late summer that it was my 2 year blogging anniversary. It was shortly after that when I lost part of my blog and got wrapped up in fixing that. It has been on my mind to do something for a giveaway, but now Christmas is drawing near and I'm caught up in creative gift making. This morning, as I went through my magazines I culled out a few as my collection is growing. These 2 are the Quilting Arts/Cloth Paper Scissors Christmas Gift Ideas from 2010. What better time than now to offer them as a giveaway. Leave me a comment before Sunday the 30th of October, 9pm EST. I will choose one and mail you the 2 magazines. 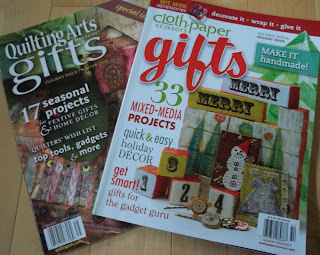 I also have some other Quilting Arts magazines from 2005 and I will offer some of those in the future if anyone is interested. Well, my week of retreats is over. 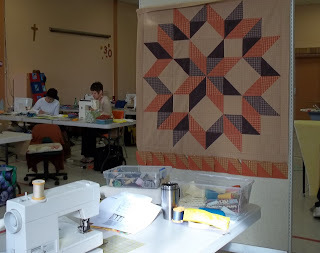 I spent the weekend from Friday afternoon until Sunday 3PM at our local guild's fall retreat. We stayed in dorm style rooms at a resource center here in town. Nonetheless, I was very careful to pack everything I needed so that I wouldn't have to leave once there. That way you really feel like you're away. It was so wonderful to spend the weekend int the company of other quilters of all ages and walks of life who all share a common interest in quilting. Our snacks and meals were announced so all we had to do was get up from our machines and go eat. On Saturday night many of us put on our pajamas early. 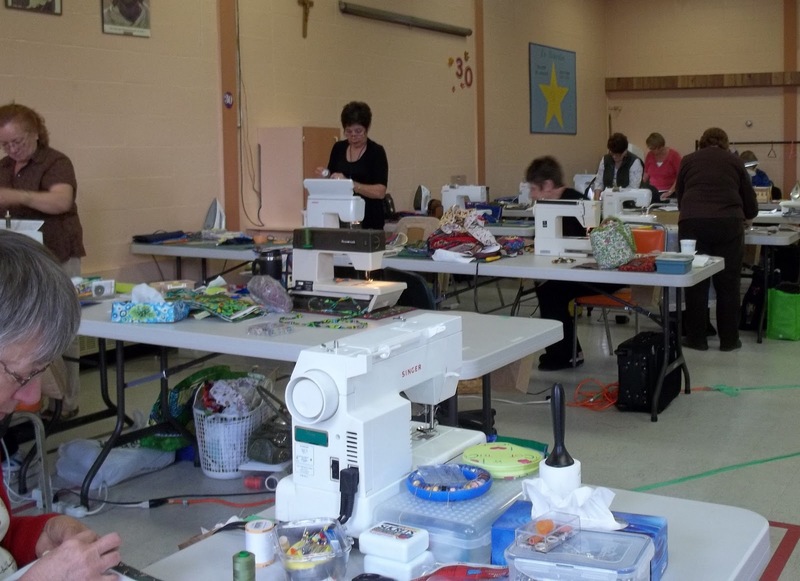 It is quite the picture to look around the room at all the women sitting at their machines in pajamas! I retired by my usual time around 10 each night but many stayed up till around 2AM. Here are some of the women at work. 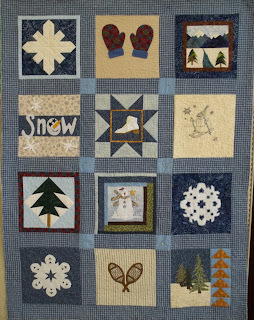 I was so happy to have finished the machine quilting and get the binding on my Winter quilt. 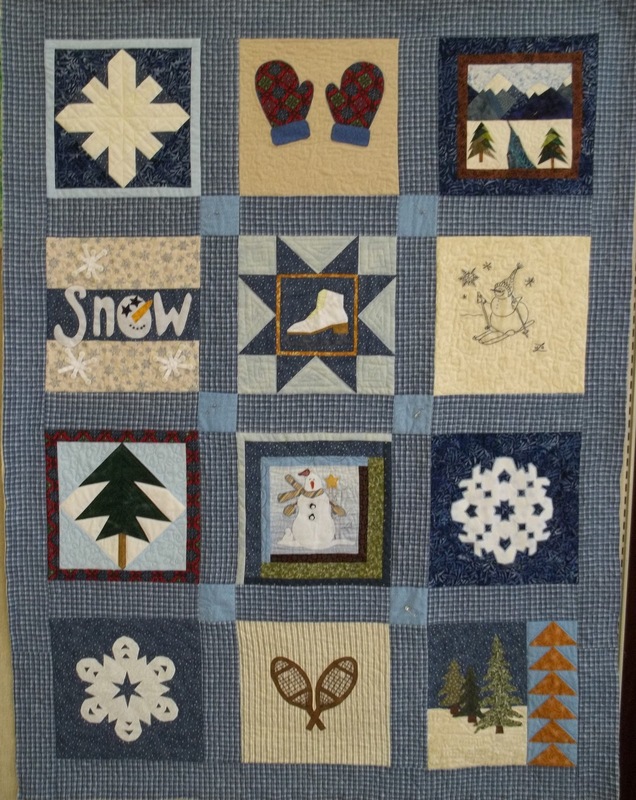 It is a quilt to which my quilting friends each contributed a block. 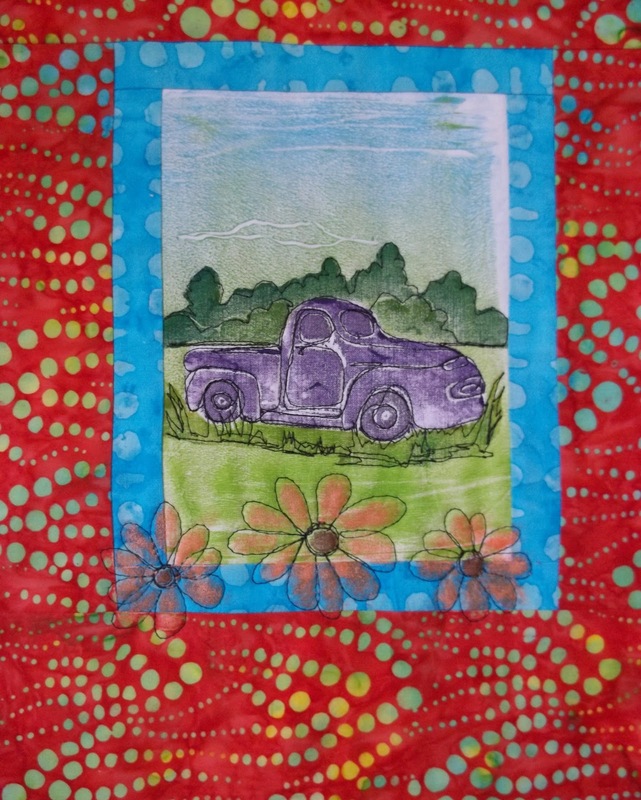 In return I did one for each of their quilts. This was a few years ago so it is about time to get it done. It will be so nice to have it out on my sofa this year. 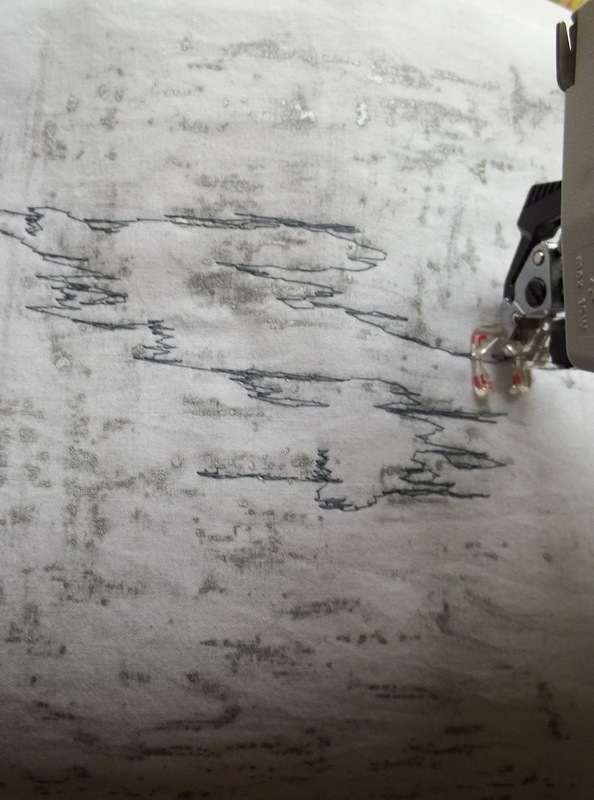 The only left is to hand sew the binding and add a few embroidered details. 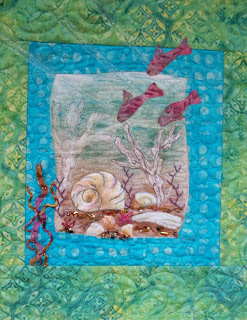 Then I machine quilted my seashell wall hanging. 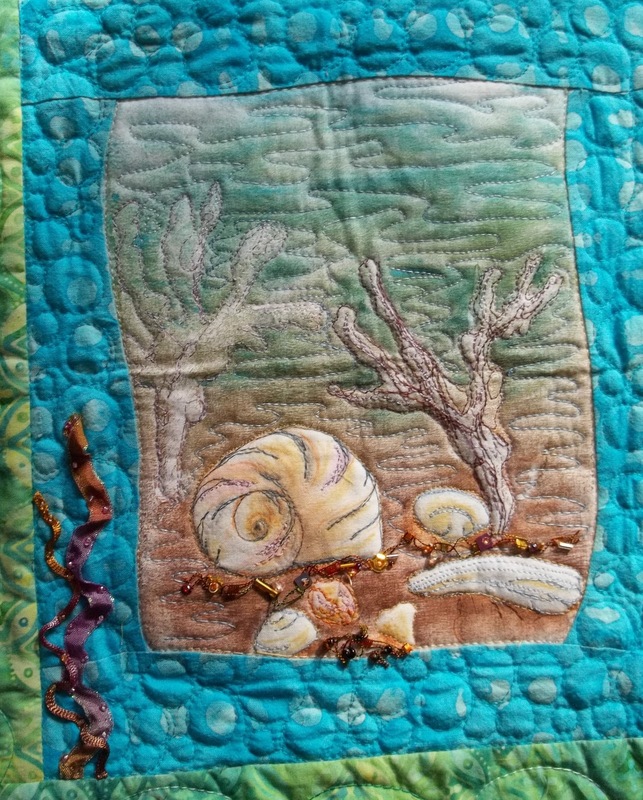 When I needed a break from the machine, I was able to start some of the embellishing. I didn't get a picture of it yet. Night time doesn't work well for photos. I'll take one tomorrow. On Sunday, I started working on a quilt that will be a gift, so sorry, once again I am unable to show it. 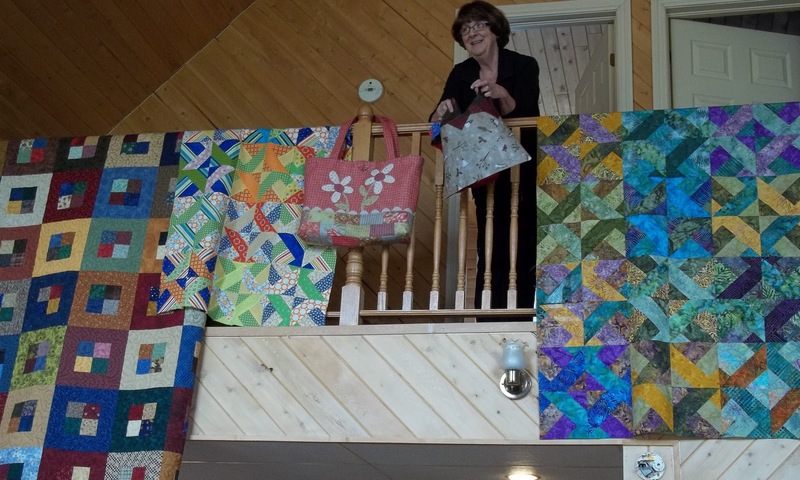 I do have a few pictures of retreat quilts. 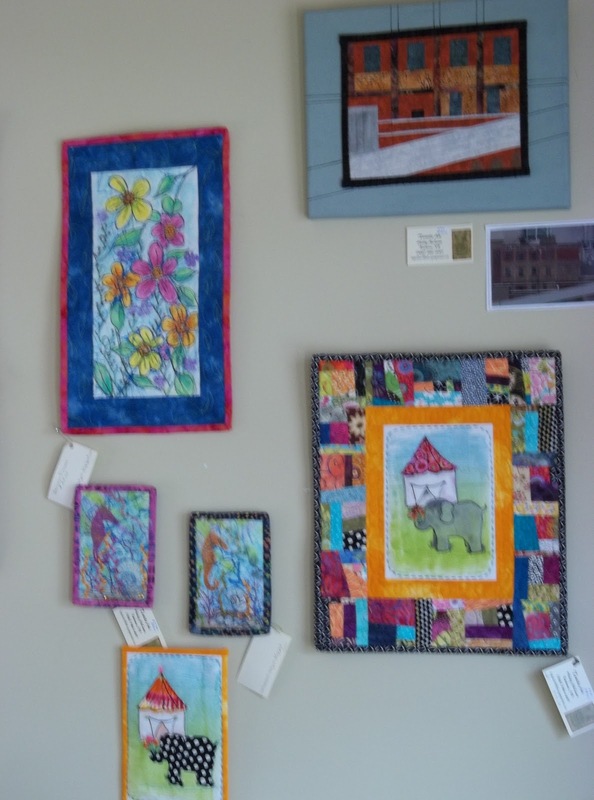 The first two shown below were done by the same lady, one for a son, one for a daughter. 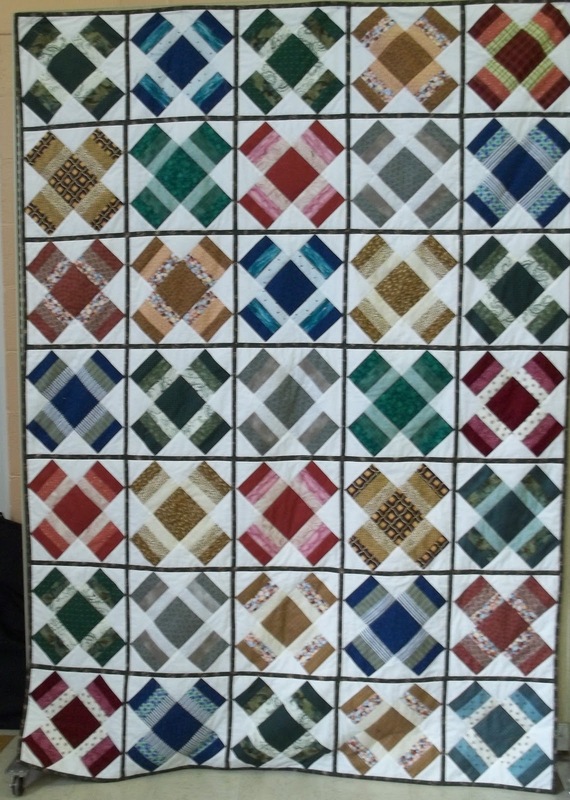 This Dresden Plate quilt is made by my friend, Wendy, using men's shirts. I did get a picture with all of the sashings in place but the color was better in this one. 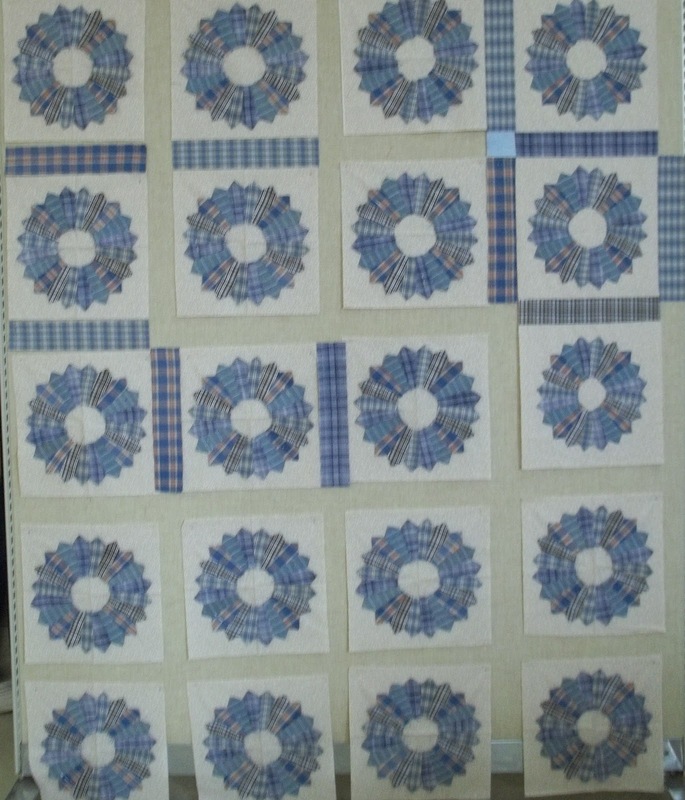 Even so, it doesn't do it justice; it is such a soft and pretty quilt. This next quilt was done by Yvon. 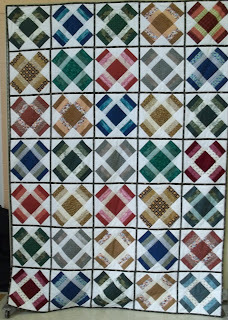 She arrived with each block done and layered with batting and she completed it as a quilt as you go quilt (each block) over the weekend. She sewed down all of the tiny sashings by hand. Amazing! We already booked the weekend for 2012. 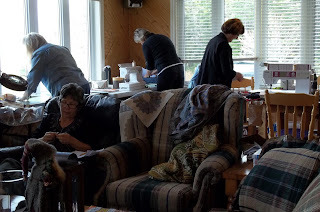 I'm busy today, packing for another retreat starting tomorrow, Friday, until Sunday afternoon, so no sewing as I didn't even unpack my machine form earlier this week. 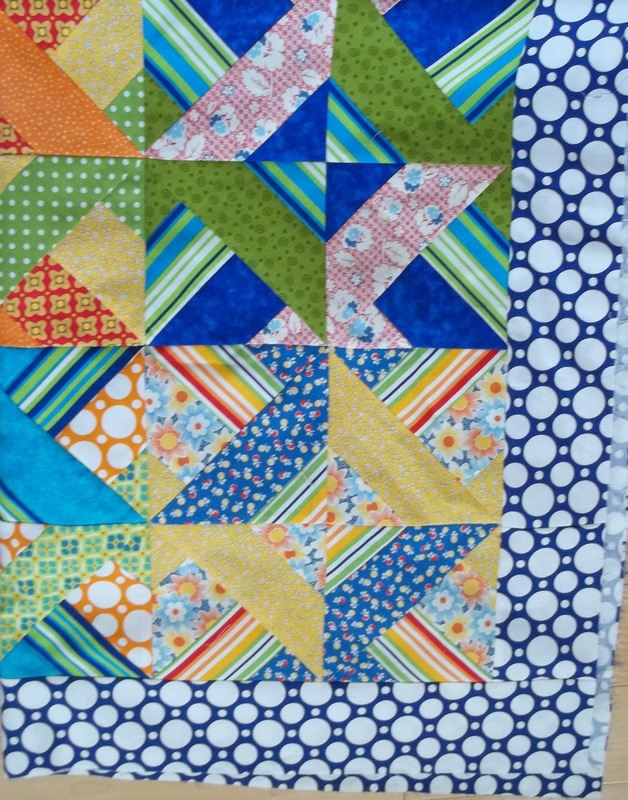 I did pull out my baby quilt and take a picture of it. 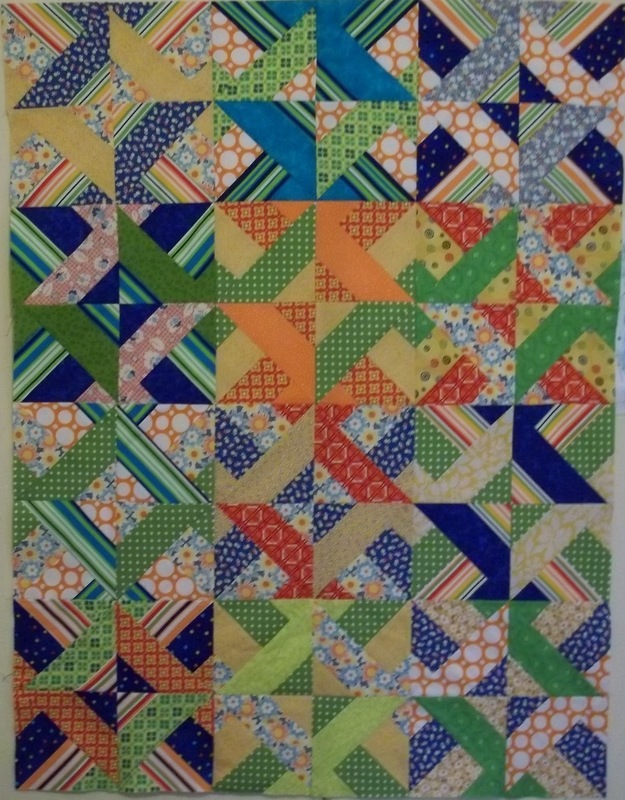 I got the pattern from this u tube video here. I got back around 6:30 last night from our semi annual group of 12 retreat which is always graciously held at our friend Paula's camp. 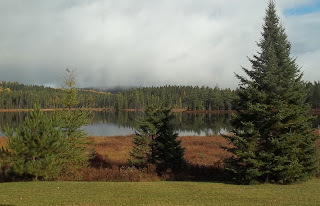 It is situated on a lake in the wilderness, about an an hour's drive from town. We drive up on an unpaved road, and thus far in about a dozen years, we have had only 2 flat tires. Oddly enough, it has happened both times to Wendy. It was discovered while loading the car to get ready to leave yesterday, and just like the first time, with some cooperation from the group, the girls got the tire changed. This was the view out the front window right beside where I was set up. We get set up by around 10AM the first day and some work until midnight (not me). I quit around 9PM and then pulled out some knitting. We end up bunking everywhere-- the beds, the floor on mattresses, the hide-a-bed, and a cot. By the 2nd morning, we are starting to hang our finished things on the 'wall of fame'. 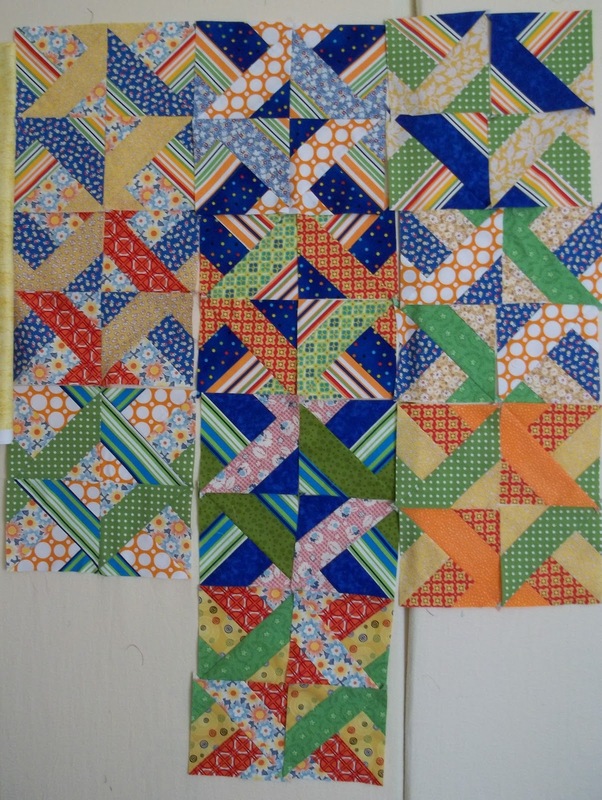 You can see that I got my baby blocks together. 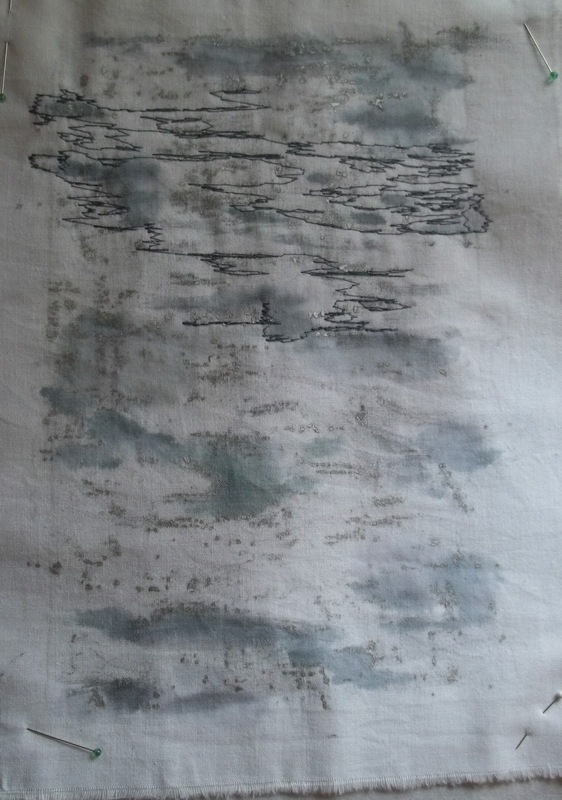 Wendy was working on a Dresden plate made from worn men's shirts. The colors were so soft and subtle. It seems like such a lot of work while we're packing to get ready, and every year it seems to take more effort, but the chatter, the laughter, the food and the camaraderie between friends makes it all worthwhile. We are all of different ages and walks of life, but we have a wonderful bond because of our love of quilting. I'm writing this quick post to let you know about the painted pumpkin in the rain. I ended up moving it into the house and will put it out on sunny days. It wasn't the gesso that came off, although it will scrape off if you rub it, it was the supposed permanent Sharpie pen that started to run in the rain. Today, I went to my guilds UFO day. My friend, Anne, who has more energy than she knows what to do with, brought supplies to make Hallowe'en and fall inspired 'fascinators'. 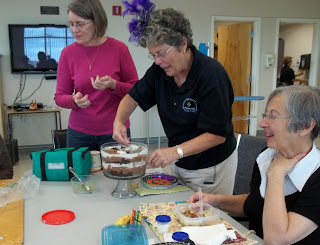 and as if that wasn't enough, she put together a chocolate trifle that was to die for. 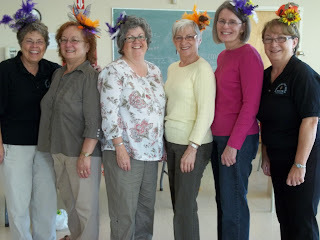 We were all so excited about the craft project that I only took pictures of the hats and the dessert! Here's mine up close. 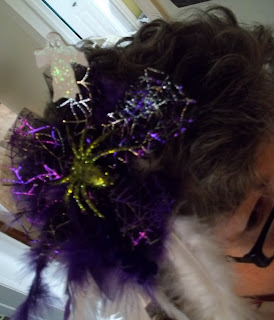 There is a hair clip with a piece of felt hot glued to it and everything else is glued to that. It all came from the dollar store. Some peaople glued theirs to a hair band. Mine is just a clip. I may not post again until later in the week as I will be getting ready for my 2 day retreat tomorrow and will be gone Monday and Tuesday. Today, I swapped out the seashell for the birch tree. 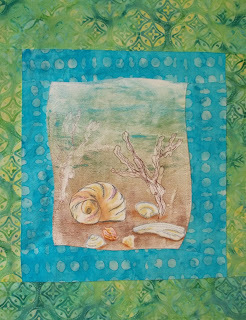 I've got the seashell up on my wall with fabric scraps pinned to it while I decide which color to choose for some appliqued seaweed. I t might help me decide if I take a picture and put it on the computer...perhaps tomorrow. 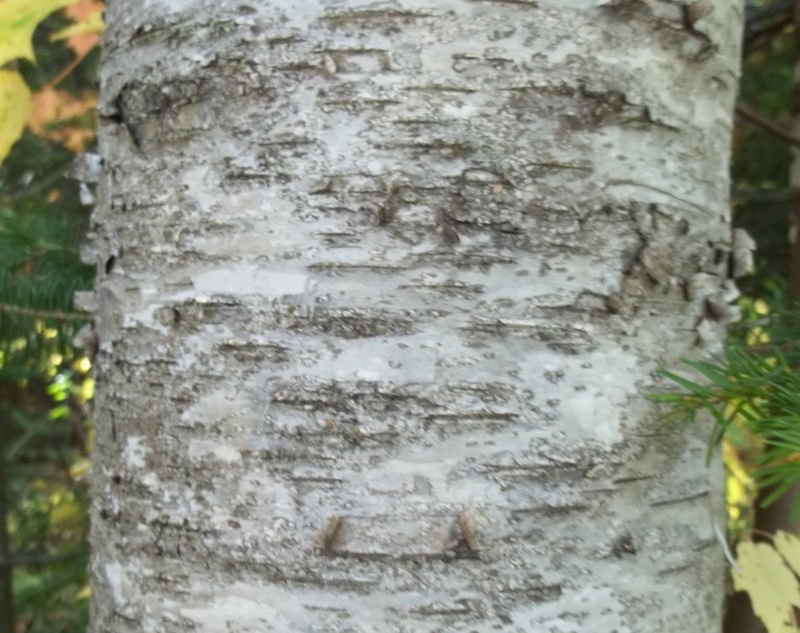 I took a picture of the birch tree rubbing as I began to thread paint it. 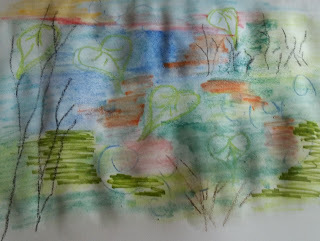 I remembered, though, as I got going , that I wanted to add some paint to some areas, so I stopped and did that using Neocolor II water soluble crayons. 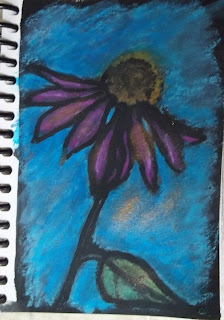 While that dried I took out some oil pastels, the Neocolor II again, and did this quick scribble in my sketchbook. This morning I bought some paint in the same colors. My plan is to paint on an old plywood door to hang in my living room. I got this idea to paint something in a sort of abstract style which I have never done before. I'm sure once I get going it will look totally different. I just wanted to get an idea to start with. I have lots of textural things to stamp with and some thermofax screens of trees.My husband cut a little off the door, filled the hollow spots, and is now working on sanding it. 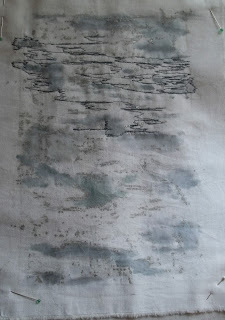 I ironed the birch tree and went back to do some more thread painting. I took this picture at a bit of an angle so the camera picked up a little of the sparkle form the silver Shiva Paintstick. I was surprised by the door bell yesterday when a friend stopped by to give me a belated birthday gift (it was last week). 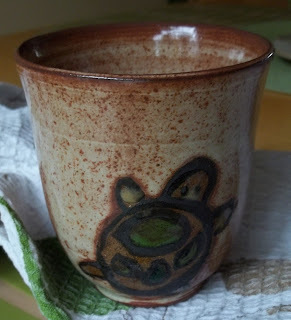 She gave me this cup that was made by a mutual friend of ours. Her Etsy shop is here. Last night, I retrieved my pumpkin from the front step and started drawing leaves on it, an inspiration that came from a tutorial by artist and blogger, Alisa Burke. She makes it look so easy. It's not that easy to draw free hand on a pumpkin and it took me about a half hour or so to paint the white. I didn't have white paint; I thought gesso might do. I'm not sure though if it is weather proof. We'll find out when it rains tomorrow. 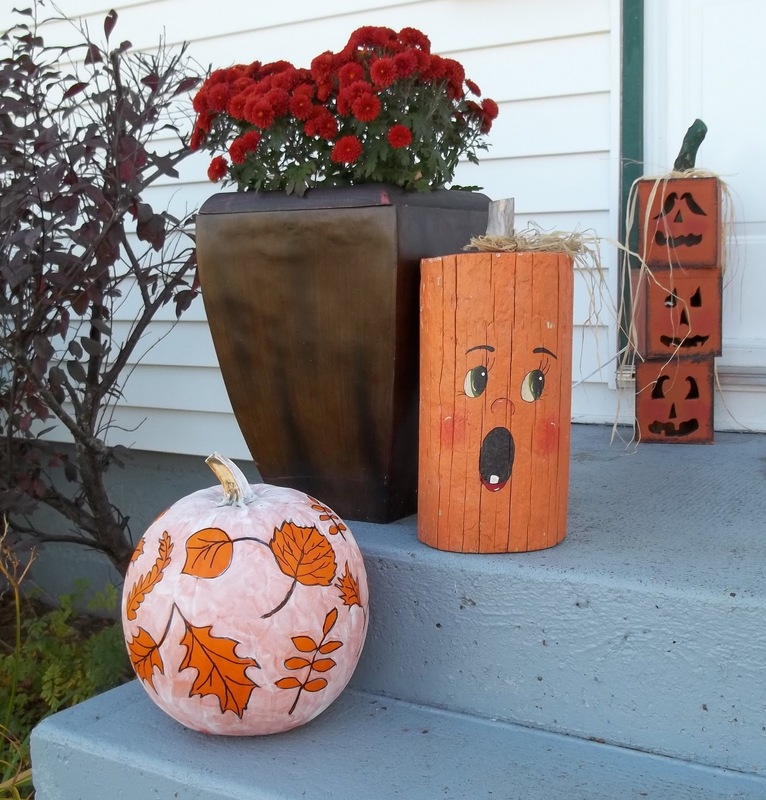 The stacked wooden pumpkin in the background was birthday gift last weekend form my son's girlfriend. There is a light inside of it--very cool at night. For those who may have followed me for a while, you will know that one can never predict what I will work on from one day to the next. There are many and various projects lying and hanging around my room. After getting all the pieces of the baby blocks mostly done yesterday, , I was free today to do something else today. 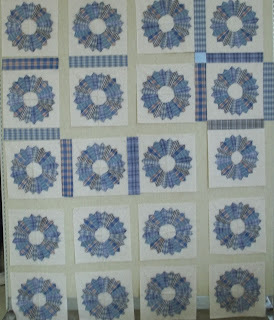 The baby quilt blocks will be good to put together at my 2 day retreat next Monday and Tuesday. 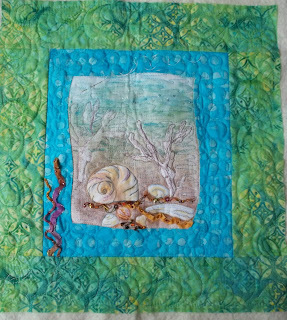 This afternoon, I cut and sewed the curvy borders for this seashell piece which took me a good hour. I cut them with the rotary cutter, marked the matching edges, snipped the curves and pinned every 1/2 inch. 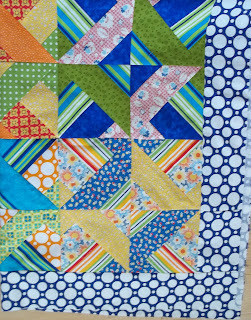 Once done, I quickly sewed on the outside green border. 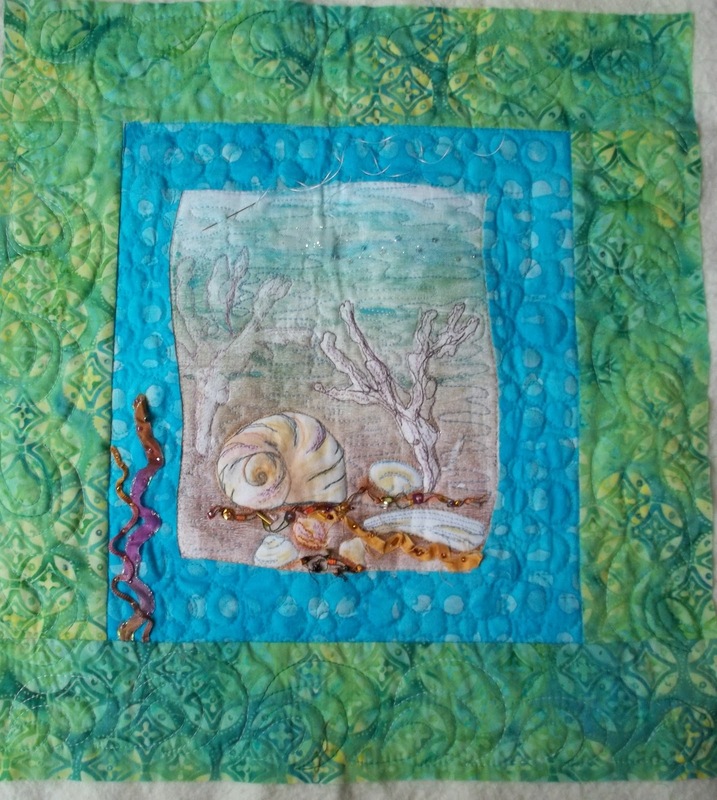 It is now ready for machine quilting. I may add some applique seaweed first though. 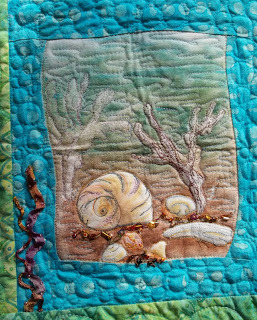 There will be lots of embellishing added after it is quilted, some by machine, some by hand. It is a work in progress that I will come back and forth to as I work on other things. I'm linking linking (every Wednesday) to the Needle and Thread Network. 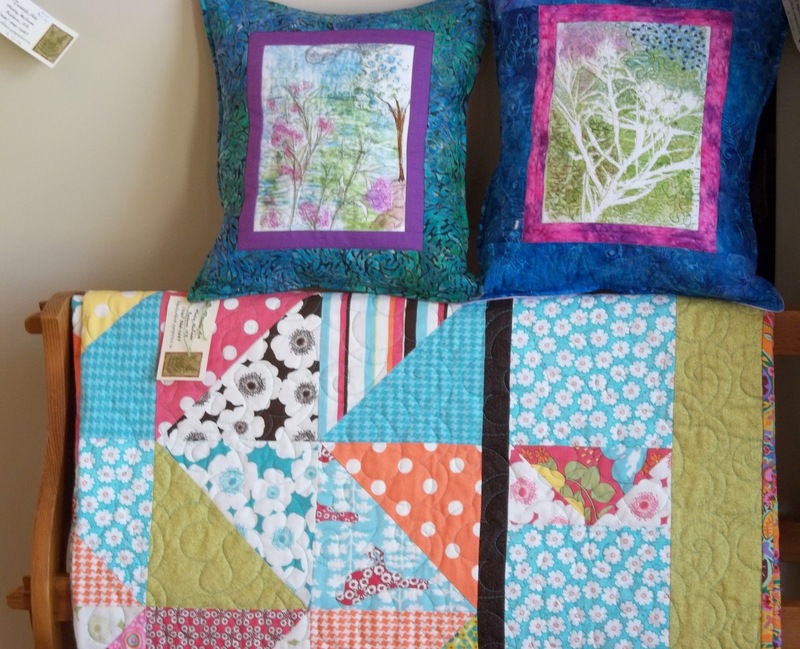 My sewing machine was calling to me today, but the sun was shining so brightly I knew I should take advantage and get outside. I grabbed my camera, a couple of paint sticks, and some fabric. This was not a cardio walk! I stopped every few moments to take pictures and I even did a couple of tree bark rubbings. 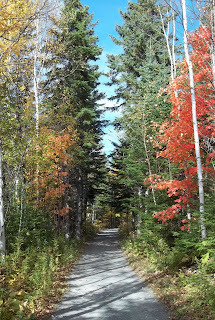 Here is one section near the beginning of the trail. This is about 5 minutes from my house. 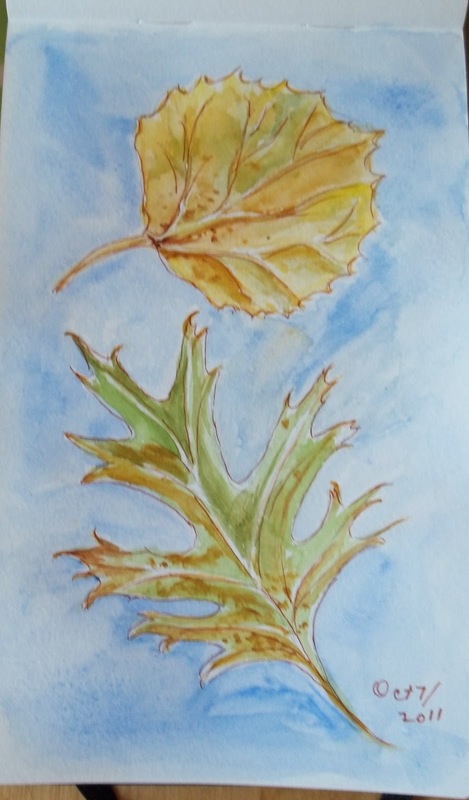 I have no real plans to do this right away but I envision some sort of a hanging with various textures of trees, perhaps with needle painted moss or leaves appliqued on top. 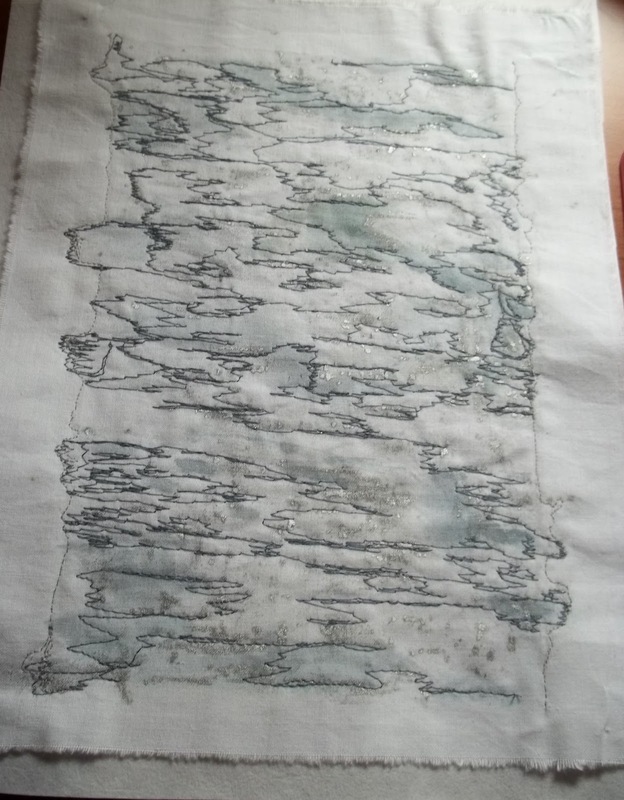 This rubbing is of a birch tree. 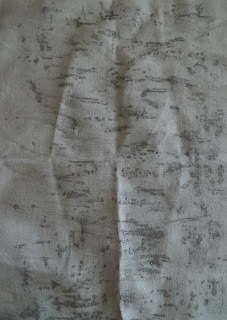 I used a silver Shiva Paint stick, so it must cure overnight and then be ironed. I haven't tried it before; I'm hoping that I can add a transparent paint over it in a different color before doing some thread painted details. 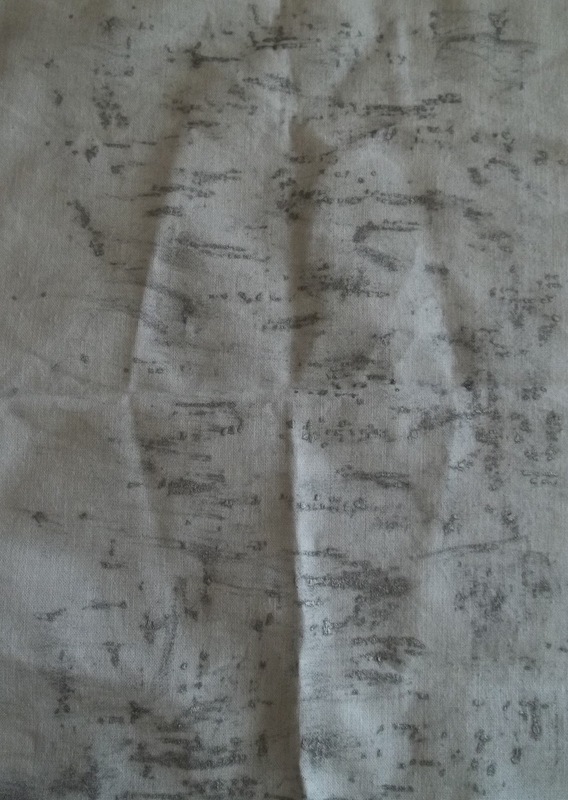 The tree is first and then the rubbing is the last picture. Sorry it was folded up in my pocket, hence the creases, and it cannot be ironed until it cures. I picked up these leaves and the sprig of asters while out for our walk on the NB Trail last night. Gord always makes fun of me because I jsut can't come home without something in my hands or pockets. 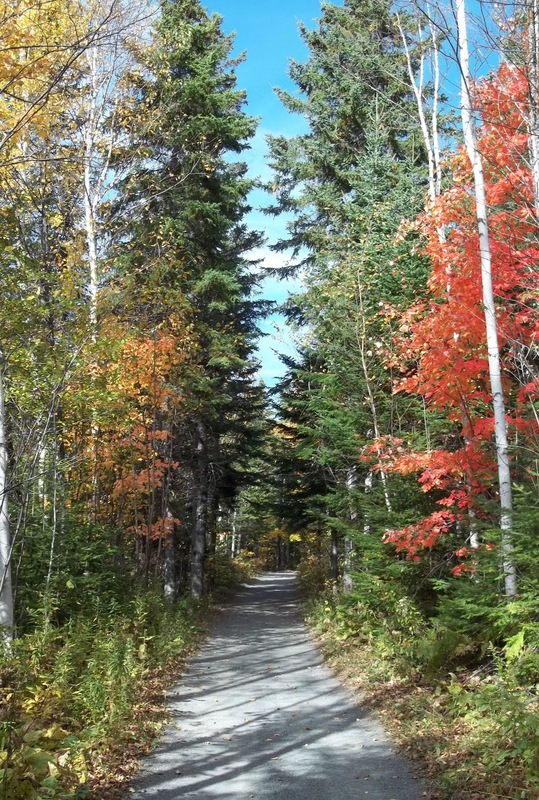 Today is sunny and extraordinarily warm for October. Our outside thermometer read 26 C. Gord did 9 holes this morning with his dad and our youngest, Jeremy (we got 1 out of 3 home) --3 generations and grandpa usually wins! Then, I met Gord and Jeremy at 1:00 o'clock and went out with them for 9 holes. What a beautiful afternoon! I couldn't ask for anything more on Thanksgiving weekend than to golf with my family. Since we were all out golfing we're ordering pizza for supper. I made a salad as a side, so it's partway healthy, right? 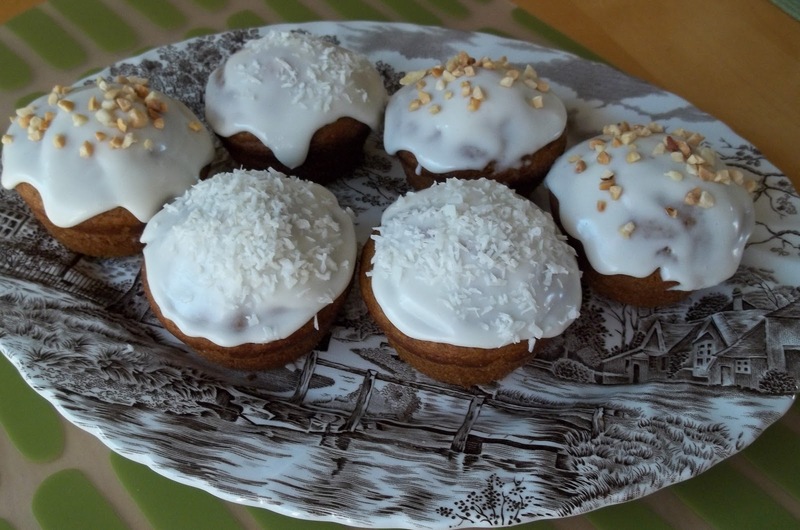 This morning I made these pumpkin cupcakes. I found the recipe here while browsing blogs the other day. The only thing I changed (I always have to do something different) was the topping; I used peanuts and coconut , just because it's what I had in the pantry. Also, I used Greek yogurt which I left to drain instead of cream cheese. 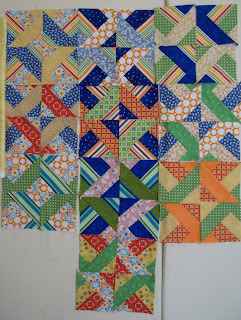 I got a few more blocks mostly sewn. 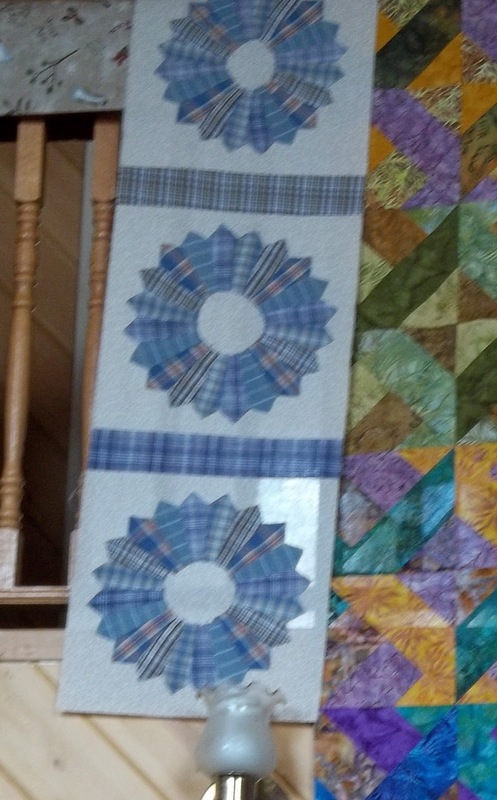 I have the final strips cut except for one that I want to get form my mother-in-law tomorrow. I'm anxious to finish it now but I'll have to wait. Oh, I know the blues are all centered. I just randomly stuck them up as I went along. Once they're all done, I'll re-arrange. It is such a trite statement, but so true! I have little idea of where the week went! I didn't do much that was creative since Tuesday until today. I had a doctor's appointment on Wednesday, and so, took advantage of being out to do a few errands. Yesterday, was my birthday and I actually went for groceries and then in the afternoon, for a walk with a friend. Today was my usual lunch day, and I also did a few errands. 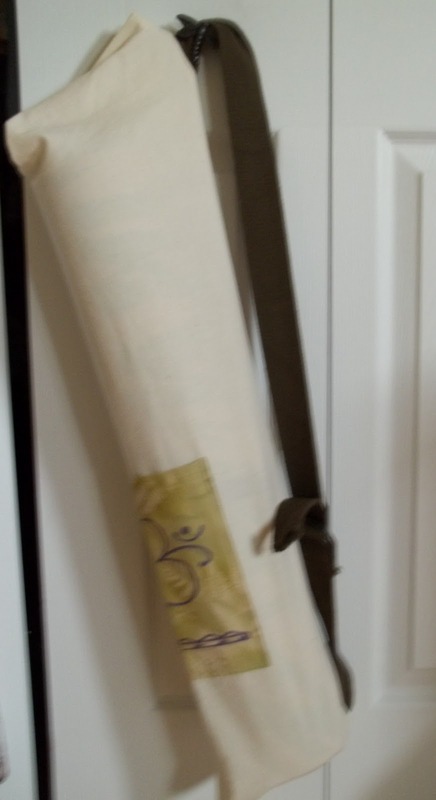 I went to Frenchies and found two fabric belts that I can use in my yoga mat bags that I'm making as Christmas presents. 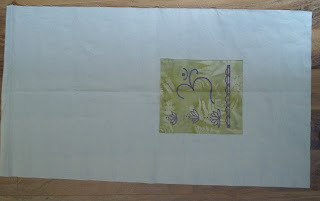 In this picture you can see the muslin prototype which I cut following the measurements of my mat. I added a couple of inches plus 1/4 inch seam allowances to the circumference and about three extra inches to the length. 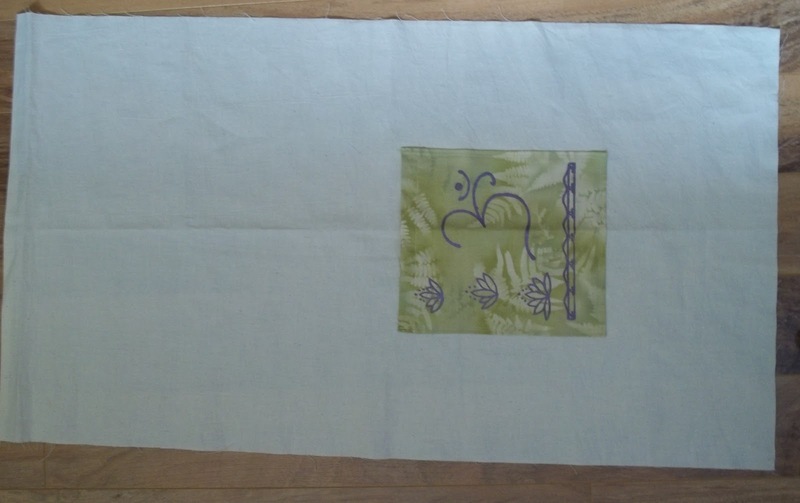 It has a silk screened pocket with the Om symbol added to the piece of muslin. I wonder if anyone can see the mistake I've made. You'll see at the end of the post. Next, I folded the raw edges back wrong sides together 1/4 of an inch and zigzagged them. I don't want them to fray and I don't have serger. 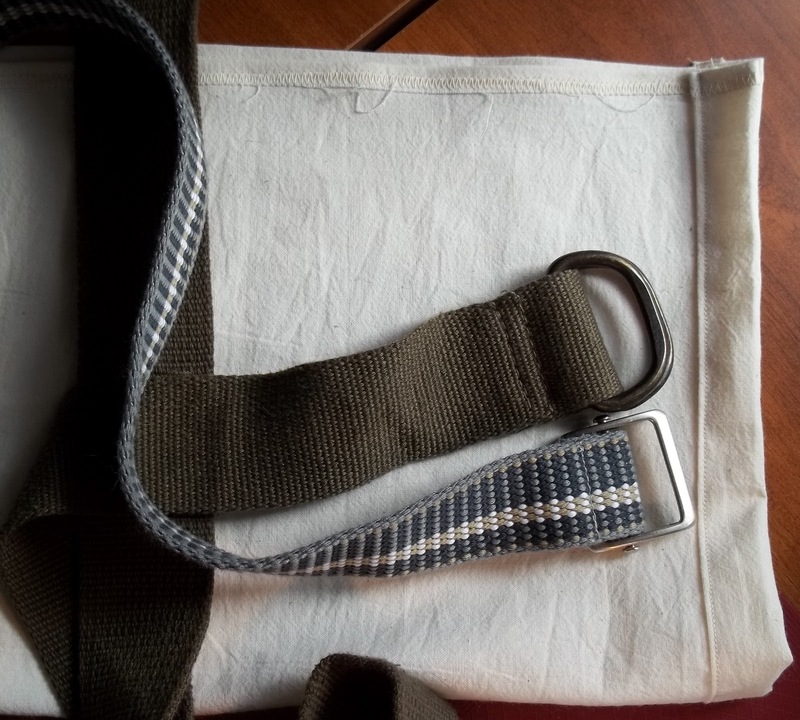 Here, you can see it pinned right sides together with the 2 belts showing. You can just barely see the folded and zigzagged edges. I cut the green belt near the buckle, leaving about 8 inches of strap and stitched it into the seam at the bottom. The other piece I stitched into the top of the bag. I've also sewn a tube at the top to run a cord through. In this picture it is mostly finished and I know what to do differently in the next one. It is a little long, although I do plan to insert a drawstring cord at the top. Also, not being a good planner, I can now see that the pocket should have been set to one side in the 1st step, instead of centered so that it would be centered on the front, dah! It's hard to put anything itno it. I will make the next bigger and perhaps add a pleat. I'm expecting my son and his girlfriend to-night until Sunday. 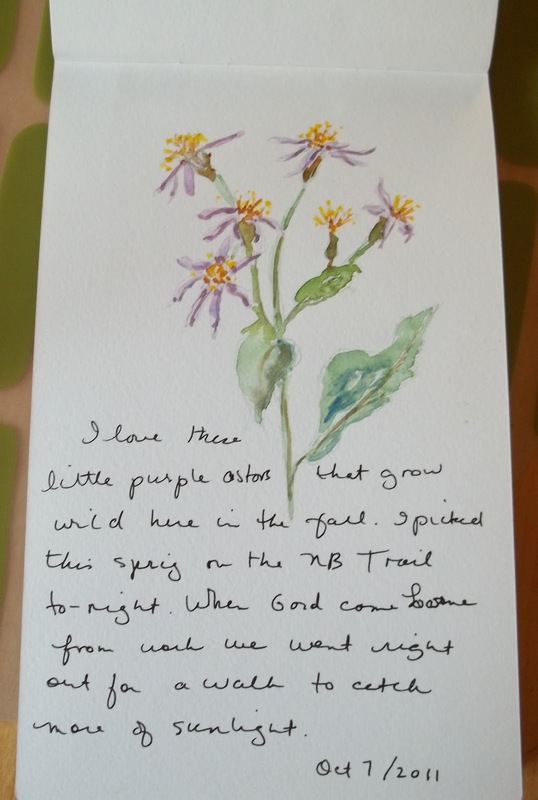 We hope to golf tomorrow and perhaps do breakfast and a nature walk on Sunday. Happy thanksgiving to all the Canadian readers! 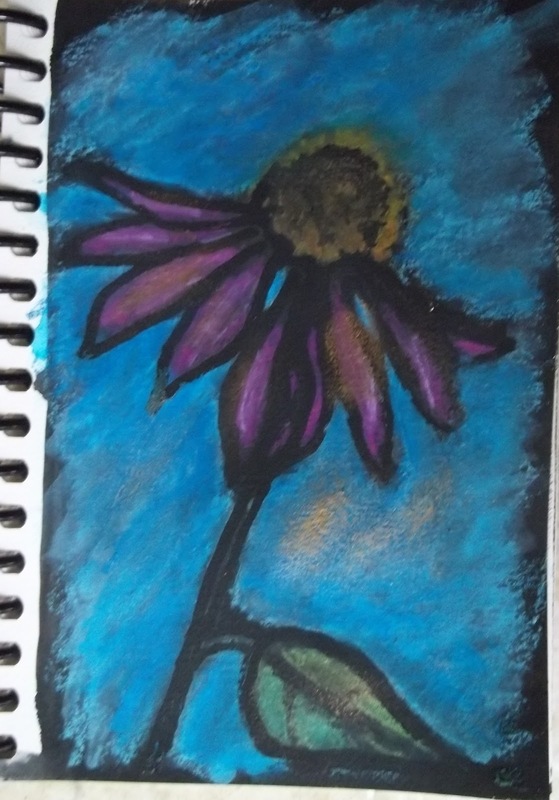 Since reading this post the other day on the blog Dion, Dior and More, I've wanted to try her method of working on black gesso with Neocolor II crayons.Today, I gave it a try with a quick sketch of my fading cone flowers. The only thing I had to change was the background. Having no black gesso, I used black acrylic paint. 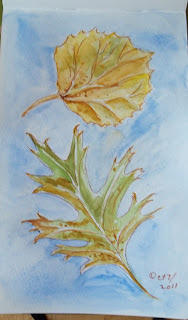 I suspect the gesso would have held the crayons better but mine seemed to work quite well. I did have to do several layers though. My lines are thick because I couldn't quickly find a brush that I wanted to put in the 'maskit', so I used the squeeze bottle nozzle and it came out in blotches. Here is my first attempt. It would be worth it to get the right gesso. 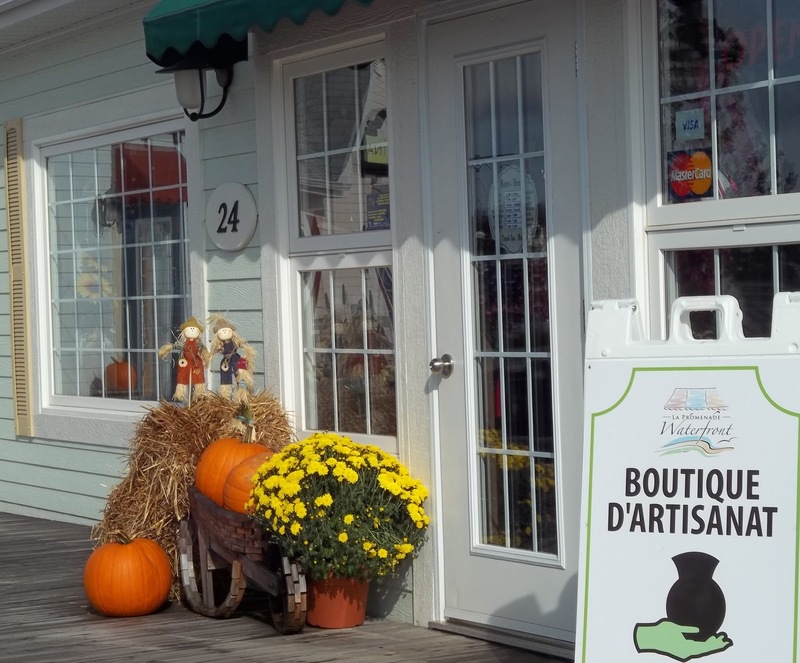 Today, I did my volunteer time at Chal Baie, our local craft shop at the downtown waterfront. It is so pretty there this time of year. 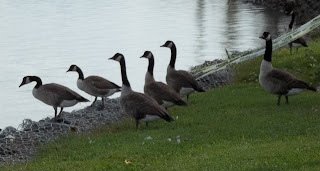 These geese were near my car when I pulled up to park. They let me take a few pictures but slowly made their way to the water. 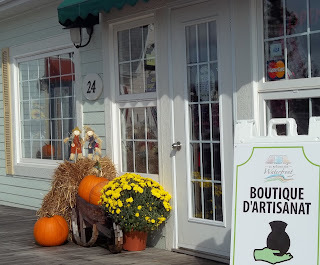 The decorations and fall colors put me in a good mood. 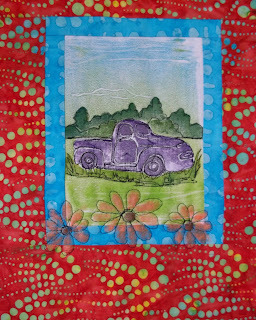 We had a good bit of traffic through today too, and I was pleasantly surprised to find that another of my wall hangings sold on the weekend. I found this photo of the center of it. 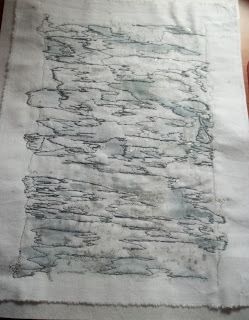 Somewhere, I have one of the whole piece but this shows most of it anyway except the binding. I don't know if it is my computer or blogger but it takes forever now to upload my photos. Does anyone else have this problem?